We’d love your help. Let us know what’s wrong with this preview of The First Noble Truth by C. Lynn Murphy. And in this way accomplish everything." Machiko Yamamoto pulls out her hair, picks at her skin, and triple checks the locks to the house behind the school where she works. When a foreigner moves into a neighboring thatched roof cottage, she quickly falls in love with the quiet woman with the mangled hand. Krista Black does not mind the weekly visits from the local English teacher. The scarred woman seems harmless, but she always wants to talk about travel and language and why Krista has come to the remote, Japanese village. Krista avoids her questions. She has seen much of the world, and she knows what it does to fragile people. Machiko may want to know her, but she could never understand her. 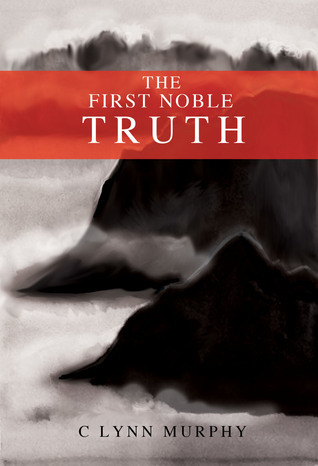 To ask other readers questions about The First Noble Truth, please sign up. The First Noble Truth is a tale told in the voices of two women. The author has made the interesting choice of giving us one voice in first person and the other in third person. Counterintuitively, I found the third person voice the more intimate of the two. Krista, in first person, relates the circumstances of her life with some detachment; Machiko’s story is immersive, full of rich detail. Krista’s suffering is caused by large events—by loss, by grief; Machiko’s by the small injustices of daily life. Krista’s story is grim; Machiko’s is heartbreaking. Krista and Machiko are very different from each other in superficial ways—race, nationality, family—yet the life of each woman is curtailed by suffering. Krista’s suffering prompts her to become an eternal vagabond, while Machiko’s affliction keeps her close to home, but each woman endures the loneliness imposed by her suffering, and in the end, it is the recognition of their shared experience that allows them to truly encounter each other. What makes this book extraordinary is the power of the writing. It builds the worlds of these two women little by little, a piece at a time, until the reader finds herself woven into the fabric of the story, until the reader discovers herself in the lives of two strangers. This is a book that will change you. What an interesting story. It started out kind of slow moving for me and just kept picking up momentum until I simply could not put it down. I wasn’t as invested in Krista’s story as I was in Michiko’s. I think because, at first, Krista’s story is more about the people around her and their history than it is about Krista. Whereas, I found Machiko’s story to be both uncomfortable and moving and I became immediately invested in her story. Overall, I found the story very moving and I truly enjoyed What an interesting story. It started out kind of slow moving for me and just kept picking up momentum until I simply could not put it down. This book is, first and foremost, beautiful. The use of language is absolutely breathtaking. Yes, some would say it's fully purple, overly detailed and clarity is compromised for poetic effect, and it's occasionally true. But less often than one would expect, considering. This is the sort of book you can slow down and read just for the sheer joy of feeling the rhythm of the words sliding over your tongue as it slowly builds itself into something substantial. The plot does wander at times, taking long detours into the interesting but largely irrelevant lives of side characters and such. Further, the use of both first and third person narratives was an interesting one. If I had to choose one main character, it would be Machiko, the third person narrative (which seems wrong to start with). The story is set in her third person present, with most of Krista's first person narrative being of past events. And they often felt like strange detours themselves, not becoming relevant until the very end when the two women's lives finally truly intersected. Thus, I felt I knew what made Krista Krista, but didn't interact with her present self enough to connect to her character. As if all that history was actually a third character. While so much of Machiko's internal thought process was explained, I knew her present self well, but not much of what made up her character outside of her Trichotillomania. Though it's worth noting that Murphy's descriptions of Machiko's compulsions were enough to make me want to pick my skin and pull my hair. I definitely related to the character's tendencies more than I should have been able to. One of my favourite aspects of this book is all the wonderful characters who provided amazing love and support to the two main characters. I think it's rare to find a book with no easily identifiable villain and in which authors manage to create believable bonds of friendship and family. It endeared them all to me. When a myst Machiko is an English teacher in a school in a small remote, yet beautiful village in Japan, where the children wear bells on their school bags, to warn away bears. She has a condition which makes her pull out her hair, pick at her skin. She finds that she can do nothing to stop herself from doing it. She struggled hard to mask the damage what her fingers had done to her appearance, she struggled to look normal. No doctor she has been to, has been able to help her with her condition. When a mysterious young woman appears in the village, everybody is curious. It's a small village with no secrets. Machiko ends up checking after her and ends up becoming the only person to interact with this woman, Krista, an American who seems to have secrets of her own, hidden away. The book alternates with Machiko's narrative and Krista's narrative and keeps the pages turning. In Machiko's and Krista's stories, is also woven the cultures and faiths that they come from, the way things are different and yet startlingly similar. It questions beliefs around suffering, the links between suffering and faiths, religious beliefs and even the similarities between religions. It makes for an interesting and thought-provoking reading. It is a tale of misfits, people who don't find themselves happy where they are, for various reasons, none of it, in their control, really. I really liked the style of writing. Loved the way the book started. The descriptions were wonderful, they took me to the places where the protagonists were at. The way the author writes about Machiko's condition is especially heartening, it is a very understanding and accepting narrative. One that brings out the pain she's going through so very well. All the characters beautifully etched out. I particularly liked the beginning which started with Krista's story. It was a painful story, but beautifully narrated. A very interesting book, but not the easiest of reads, especially if you aren't in the right frame of mind to read it. A heavy read, but a recommended one, if you like books of this sort. I've given it a 3.5/5 but that's mainly go do with the fact that it was a little heavy going for me in places. The story is about two young women with one story told in the first person and the other in the third person. The wo I want to say firstly that the book description on the review websites needs to be re-written. I received a copy of the book in return for an honest review and if it hadn’t been offered I would not have purchased a copy based on the description. C Lynn Murphy's first novel is an intricately entwined narrative set between two very different protagonists. While I love the first chapter, focusing on Krista Black, and the lush details of her life, the even chapters challenged me as a reader. Without giving away any of the last half of the book, Machiko Yamamoto's story has a pristine quality that mirrors her disease. While Krista has a nice tourist-pilgrimage narrative throughout Africa, various countries of the Himalayas and eventually Japan, you can find a dozen stories like hers- even if Murphy does include such beautiful imagery as the garden at the end of the first chapter, and the squalor of a hotel in Kathmandu among other places. Going back to Machiko, Murphy's language poignantly offers the reader a brush with the English teacher's illness. While the landscape of her life is plucked of ugly details in her mountain village, it is her actions that likewise have robbed her life of the intricacies of human interaction. Not that there aren't wonderful details about life there; I especially loved the children with bells attached to their book-bags. Possible spoilers: the stigma surronding trichotillomania is just as bad as many other mental health issues such as depression, but with less publicity. It was Murphy's insight into someone's suffering that gave Machiko's chapters their beauty for me. I can count the books who can do that on one hand, and they are some of my favorite books (Dune, Dhalgren, Flower for Algernon). The First Noble Truth's introductory sentence - and those that immediately follow - is a powerful portent of things to come: "My father arrived late to my conception. His day had been difficult." It takes a while for one to realize that this story is actually being told from the viewpoints of two very different women: Japanese rural teacher Machiko, whose compulsion to self-injure reflects deeper traumas in her life, and that of Krista, whose life holds equally somber tones of danger and pain. Th The First Noble Truth's introductory sentence - and those that immediately follow - is a powerful portent of things to come: "My father arrived late to my conception. His day had been difficult." It takes a while for one to realize that this story is actually being told from the viewpoints of two very different women: Japanese rural teacher Machiko, whose compulsion to self-injure reflects deeper traumas in her life, and that of Krista, whose life holds equally somber tones of danger and pain. The unifying link between their experiences is suffering - and this is narrated in chapters packed with insights and impressions that are not easily solved by conventional processes of healing, recovery, and logic. It's a read recommended not for light leisure pursuit, but for those who seek the gems of literary brilliance in the trappings of everyday lives. I was about a quarter of the way through this book when I realized that I had no idea what was going on, or where the book was going; yet only a moment later, I knew that I didn’t care that I didn’t know. Some books feel kind of pointless and I’m disappointed. Some books feel without point, but that’s only because they meander through their prose. This book was the latter, but it worked. It was addictively lyrical, and I just could not stop reading, even when I felt clueless. Much of this book had I was about a quarter of the way through this book when I realized that I had no idea what was going on, or where the book was going; yet only a moment later, I knew that I didn’t care that I didn’t know. Some books feel kind of pointless and I’m disappointed. Some books feel without point, but that’s only because they meander through their prose. Much of this book had an undercurrent of sorrow and it brought in many “harsh realities,” I’ll call them, but very subtly done. Through out, though, the sadness was mixed with enough streams of light that it didn’t drag you down. It just pulled you into the characters more, as you wondered about them and with them. Enough to bring hope along with it. And our two main characters were an interesting counter-balance to each other in terms of the sorrow and hope. I’ll also note that Michiko’s troubles are of an interesting sort, in that it’s not something you expect to be chosen for a character. I know enough about the disorder from a non-fiction perspective, but it surprised me in fiction. Yet it worked, and added an intriguing layer. Can a book be good and bad at the same time? Evidently! This novel reads as if written by two different people or if by one, a person with a split writing personality. The story is written from two points of view. One, first person, the second third person. The parts in first person are gripping, dramatic, page turning, emotional, and paint a very good story. The second viewpoint is sluggish, boring, way too much telling, and difficult to slog through. The author seems to be trying to capture the mindset of the character in third person by writing as if that character were narrating. If that was the author's intent, it didn't work. My view here is that the author when writing first person is writing from the heart, from experience or at least a close knowledge of what this character feels. When in third person, the author seems to be reaching for words to tell us that character's story. There in lies the issue, too much telling and not enough showing. I did not have a reason to like or dislike the character, she seemed flat. The First Noble Truth refers to core teachings of Buddhism, life is suffering, or in the words of a monk in this novel: life is full of discontent. Machiko Yamamoto has a obsessive-compulsive disorder. She constantly is pulling out all of her hair, picking her skin. Though medical asisstance and temporary successes to refrain from that addiction, she's major fall backs. It hinders her work as English teacher. The other protagonist in the book is Krista Black, who happened to have a mangled hand. The First Noble Truth refers to core teachings of Buddhism, life is suffering, or in the words of a monk in this novel: life is full of discontent. Machiko Yamamoto has a obsessive-compulsive disorder. She constantly is pulling out all of her hair, picking her skin. Though medical asisstance and temporary successes to refrain from that addiction, she's major fall backs. It hinders her work as English teacher. The other protagonist in the book is Krista Black, who happened to have a mangled hand. After travels from Africa she ends up in a neighbouring cottage. A deep friendship with Machiko is developing, seeking answers to existential questions. Cultures, religions and languages clash and interrelate. Thin lines between suffer and happiness, whether it's about keeping a job, sexuality, cruelty and openness for religion are carefully crafted into the story. Fatalism, inescapeable karma, and an deep conviction of the absence of divine intervention leave little room for forgiveness after failures. I am surprised how the author could write a book containing death, sadness, and suffering while leaving me with a peaceful feeling at the end. The two main characters are Machiko Yamamoto and Krista Black. Two different women from two very different ways of life. They spark a friendship around traveling, language, and culture. I enjoyed the in-depth background given about each protagonist and especially appreciated how mental illness was treated vastly different in the two lifestyles. The First I am surprised how the author could write a book containing death, sadness, and suffering while leaving me with a peaceful feeling at the end. The two main characters are Machiko Yamamoto and Krista Black. Two different women from two very different ways of life. They spark a friendship around traveling, language, and culture. C Lynn Murphy was born in New Hampshire, but has since lived in Scotland, France, Germany, Italy, Japan, England, Nepal, India, and Mongolia. She also spent a year backpacking across the African continent for kicks. Whi C Lynn Murphy was born in New Hampshire, but has since lived in Scotland, France, Germany, Italy, Japan, England, Nepal, India, and Mongolia. She also spent a year backpacking across the African continent for kicks.